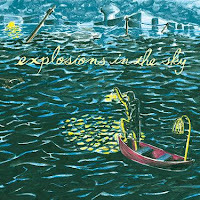 We've always been fans of Explosions In The Sky. One of the post Mogwai, post Godspeed outfits so adept at crafting super epic and emotional instrumental soundscapes -- post rock, math rock, jangly pop, chamber music, all sort of whipped into grandiose cinematic swells. But past records, while sounding amazing, with the right balance of mood and metal, hush and heaviness, still stuck a little too close to the template of their forbears. EITS were like the perfect mix of Godspeed and old more bombastic Mogwai. And not much more. Nothing wrong with that really, it just never totally blew us away. But All Of A Sudden I Miss Everyone is different. And it does blow us away. In a big way. It still sounds like EITS, and thus still sounds a bit like Godspeed and Mogwai, but like any great band in the last 20 years, it's not who you steal from, or what you steal, it's how you make what you steal your own. And EITS have made epic instrumental post rock all their own. The opener is everything this sort of music could and should be. Super dense and dramatic, spacious and emotional, opening with keening high end melodies over big jangly guitar strum and huge percussive For Those About To Rock blasts, the guitars slowly intertwining and drifting off, fading to a moody minor key post rock drift, underpinned by layer after layer of fuzzy blissy guitar and a motorik rhythmic shuffle before the completely perfect bridge, a spaced out melody, all dynamic and epic, that will definitely give you goosebumps, before launching into a full on heavy math rock groove, incorporating that same hair raising melody, with some killer drumming and a veritable orchestra of guitars. The rest of the record plays out in similar, albeit slightly less bombastic fashion. Each track perfectly leading into the next, an expansive post rock epic, separated into movements, chiming guitars, thick riffs, each track gloriously tangled and emotional, with long stretches of cinematic ambience, some shimmering strings, glistening melodies, lush harmonies, bits of piano, and some amazingly expressive drumming. All Of A Sudden also includes a bonus disc, an entire remix of the album, each track reworked by a different artist. Jesu turns the epic opener into a fuzzier, blissier, and toward the end a MUCH heavier beast. Adem's remix is all low key and abstract, acoustic guitars, simple percussion and glistening chimes, a whispery shadow of the original. The Paper Chase wraps the original track in a glorious swirl of murky ambience, adding a stuttery drum machine rhythm and all sorts of strange sonic filigree. Mountains gives their track a serious Pop Ambient makeover, stretched out and languorous, swirling and shimmery, ending with a long expanse of solo piano. Four Tet's reimagination is the most dramatic, a blissed out shuffling electronic workout, all processed drums, shuffling and skittering, with the original track nestled beneath layers of synth fuzz and strange subtle FX. Finally, labelmates Eluvium transform the album closer into a fuzzy smear of pixelated ambience, that builds and builds, much like the original, but in this version, into a blown out, super distorted fuzzy dreamscape. this is a beautifully written entry. well done. halo. i've just dowloaded (EITSAOASIME_by_lateralnoise.rar - RAR archive, unpacked size 0 bytes) but i couldnt because it required decryption code before it can be opened. So , can u give me the password/code?..plz.. I took the whole day downloaded it.